Confused by Nautical Terms and Phrases, or Just Plain Curious? Ever been confused by nautical terms? Do sailing expressions and nautical phrases leave you all at sea? Can’t tell your boom from your bumkin or your tumblehome from your baggywrinkle? Aback ~ A sail is said to be aback when the wind is blowing into the wrong (the forward) side of it. Abaft ~ An object or part of the boat which is located astern of the widest part of the hull, ie ‘abaft the beam’. Abeam ~ At right angles to the fore and aft centreline of the boat at the widest part of the boat. About ~ When the bow of a boat, when changing direction, crosses the wind it is said to have ‘gone about’. Aft ~ A nautical term referring to the rear end of a boat. Towards the stern. Aground ~ A boat which is touching the bottom is ‘aground’. Ahead ~ In front of the boat. A-hull ~ To ride out a storm with no sails set and the helm lashed down to leeward. Aka ~ The transverse struts that hold the three hulls of a trimaran together. Alee ~ Downwind, to the leeward side. Amidships (or Midships) ~ Midway between the bow and the stern. To put the helm amidships is to centre the wheel or tiller so that the boat steers straight ahead. Anchors Aweigh ~ The anchor has broken free of the seabed and the boat is free to move. Apparent Wind ~ The wind force experienced by a moving vessel, influenced by boat speed and course. The true wind would only be felt when the boat was absoltely stationary. 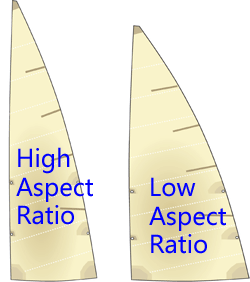 Aspect Ratio ~ The ratio between height and width – usually used to describe sails and foils such a daggerboards and rudders. Long and narrow - as the left-hand sail shown here - are said to be of 'high' aspect ratio, whilst the shorter squatter example is low aspect ratio. Astern ~ Behind the boat. Athwartship ~ Acting or lying sideways across a vessel. Auxiliary ~ Another name for the engine in a sailboat. Azimuth ~ An angular distance measured on a horizon circle in a clockwise direction, usually between an observer and a heavenly body. Baby stay ~ Also called 'inner forestay'. 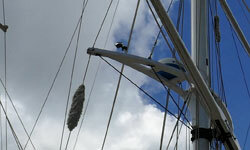 A stay rigged between the forestay and the mast. Back ~ (1) To back a sail is to have it sheeted on the windward side so that the sail's drive pushes a boat's bow around. (see 'aback'). Such a sail is said to be 'backwinded'. (2) When the wind backs, it has changed its direction anti-clockwise. Backstay ~ Part of the standing rigging. A wire (or wires, since double backstays are common) that opposes the forces imposed by the 'forestay'. Baggywrinkle ~ An old nautical term referring to the padding, often made from old rope, wound around the rigging to help prevent sail chafe. Bail ~ To remove water from a boat by means of a bucket or a pump. Balanced Rudder ~ A rudder that has 10% or more of its area forward of its stock (pivot point). Ballast ~ Additional weight place low in a boat (usually in the bilge) to add to its stability and steadiness. Barber hauler ~ A line used to change the lead of a sheet. Bare pole ~ The spar of a boat without it sail. To sail under bare poles downwind is a recognised heavy weather survival technique. Barnacle ~ A shellfish that attaches itself to the hull, often in sufficient numbers to induce performance-reducing drag. Batten Down ~ Securing the boats gear and hatches etc, in anticipation of rough weather.